Mildred McGaffigan of Pembroke was preparing for a busy weekend on a Thursday afternoon in July 2016. She planned to register for an art class when her husband was back with their car. She had a cribbage tournament on Saturday, and planned to play bocce on Sunday. But she was most focused on the garden party she was hosting the next day. After tidying up her garden, Mildred was rushing back into her garage when she missed a small step. She thought her shin had just grazed the door frame as she fell. "It was true carelessness on my part," Mildred says. The injury looked pretty bad, but Mildred didn’t realize how bad. She didn’t call her doctor. The then 82-year-old hosted her garden party that Friday. She played cribbage and bocce. By the time Monday came, she decided she felt better. She still didn't call her doctor. But after a few more days, she realized her wound wasn't healing properly and went to an urgent care clinic. The clinic cleaned Mildred’s wound, which was so deep the muscles were visible. The doctors told her she'd need her primary care physician to refer her to a wound care center for further treatment. Mildred's daughter, Susan Romano, contacted The South Shore Health Center for Wound Healing immediately and was able to make an appointment for the following day. "As a colleague of South Shore Health, I know the great work that is done every day at our Center for Wound Healing. I wouldn't trust my mother's care to anyone else," Susan says. 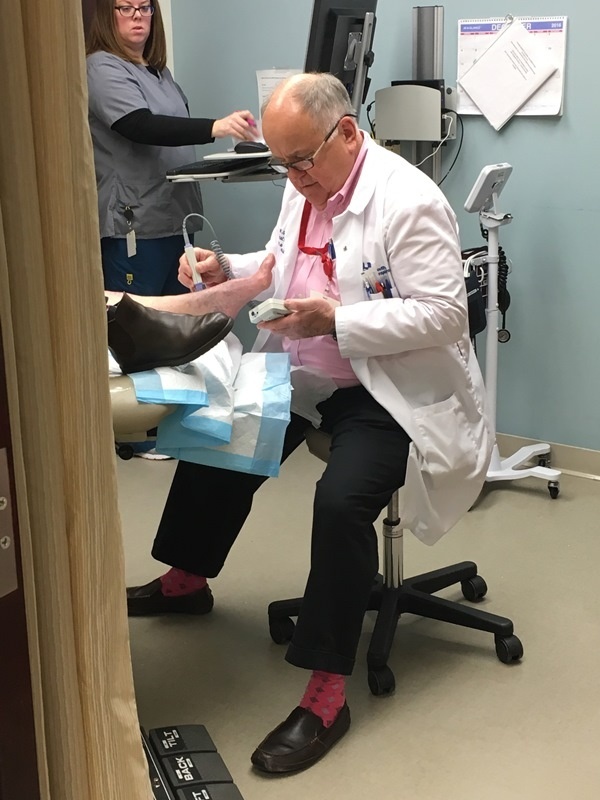 Mildred was apprehensive before her first appointment, but was put at ease when she met Gary Gibbons, MD, FACS, Medical Director of the Center for Wound Healing. "When I first met him, it was like I had known him all my life," Mildred recalled. "I felt so comfortable. Dr. Gibbons questioned me in such a light way I didn't know I was being questioned. I cannot say enough about him." Dr. Gibbons knew right away Mildred’s injury was more serious than she thought. Dr. Gibbons determined that UltraMIST treatments would be most effective in treating Mildred’s complex wound and reducing her pain. This device uses saline mist to deliver low frequency ultrasound to a wound, which helps stimulate circulation, eliminates bacteria, and gently stimulates the wound to get into a healing phase. While proven effective in many clinical trials, the Center for Wound Healing is among the first wound care centers in the United States to adopt and use this treatment. The Center’s nurses and medical assistants are thoroughly trained to administer this therapy, which is painless. Dr. Gibbons also recognized the importance of not letting muscles near the wound move, immobilizing the ankle to rest the injured muscle. Mildred would have to spend most of her time in bed. Moving only to take the 24 painful steps to her bathroom and back to bed was tough for the self-described "doer," but she understood the importance of immobilizing the injured area. "That first week, you couldn't console me," Mildred says. But that wasn’t all the doctor ordered for Mildred. She was a smoker, and had evidence of some arterial disease evident in her leg. Mildred visited the South Shore Health Center for Wound Healing three days a week for intensive wound care and UltraMIST therapy from Dr. Gibbons and his team, receiving support from everyone as she quit smoking. She came to view her trips to the Center as a social call. Mildred usually had two nurses helping to deliver her treatment, but many more came in to check in on her and say hello. “My mother is an extremely social person. This kept her going. She was never down or depressed because the experience was like visiting friends with some treatment mixed in,” Susan says. 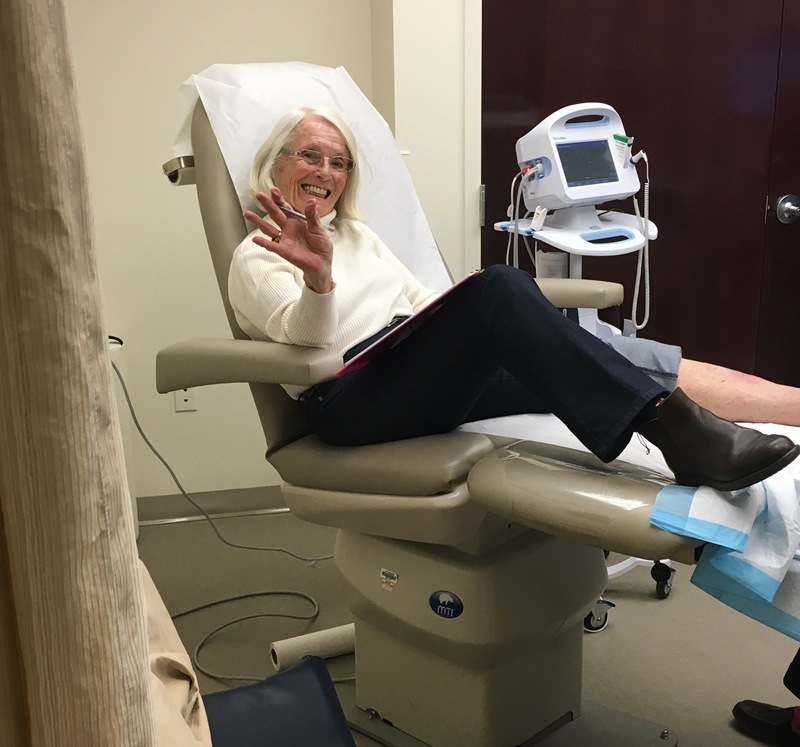 In January 2017, six months after her first visit, Mildred participated in one of the highlights of the Center for Wound Healing—the ringing of the bell. During her first visit, Mildred had mistaken it for a fire alarm. But the bell-ringing signifies the completion of a patient's treatment because their wound has healed. Nurses, doctors and the entire team gather around the patient to celebrate his or her success. It meant so much to Mildred she bought the Center for Wound Healing a new bell—which Dr. Gibbons calls “the bell of bells.” See the video of Mildred's ceremony—including Dr. Gibbons using the new bell—below. Mildred and Susan were so grateful for the incredible care Mildred received they made a donation in honor of the Center for Wound Healing and Dr. Gibbons through South Shore Health's Honor Your Caregiver program. Today, Mildred is in physical therapy at the South Shore Health Center for Orthopedics, Spine and Sports Medicine. While her wound has healed well, the rest she required during treatment has weakened her muscles and affected her balance. “She’s a motivated patient who wants to get back to her active lifestyle and that’s always a great patient to work with,” says Lina Penikas Lamb, Physical Therapy Specialist at the Center for Orthopedics, Spine and Sports Medicine. Mildred hasn’t been able to resume the daily three-mile walks she enjoyed prior to her injury yet, but she was able to plant dahlias in her garden this year. Her smoking habit is also gone for good. While she hopes she never has to return as a patient, Mildred fondly remembers her time at the South Shore Health Center for Wound Healing. "Would I want to go through it again because of my injury? No. But if I had to do it again, I'd do it there. I had a wonderful experience." To learn more about Dr. Gibbons and the Center for Wound Healing, please visit our website. To learn more about our Grateful Patient program, click here.